We all know that it's a good thing when highsec PvE corps get wardecced and awoxed. Carebear corps are bad for players, especially new players who don't know what else the game has to offer. EVE benefits when the carebear corps are dismantled, because it allows the members to be redistributed among groups that know how to play the game and have fun. With that in mind, let's revisit the story of an awoxed corp and find out what happened to its membership. Yoshiyo Solette > And this is why I can't have a corp.
Now to find out what took place after the carebear corp was brought into Code compliance. Wendy, of course, learned that the New Order was right all along. She joined CODE. Before making her allegiance to the New Order official, Wendy's actions were viewed by the carebears as quite provocative. 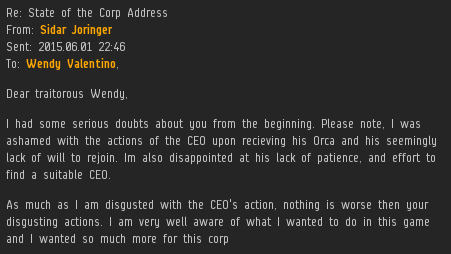 Sidar Joringer wrote a lengthy EVEmail to Wendy. He chastised her for enforcing the Code. For some reason, he had thought Essence Distribution and Mining had a chance for bright future under Yoshiyo's leadership. In fact, this is typical of the carebear apologists. They think EVE benefits from protecting--to the point of invulnerability--the corps who offer the worst possible gaming experience. Or maybe Sidar had a financial motive for his angst. With carebears, it always comes down to isk. But a few days later, he wrote Wendy back. Sidar had a change of heart. Indeed, a dramatic change of heart. After thinking things over, Sidar had come to the realization that Wendy and the New Order were right to destroy the corp. He then joined Pandemic Horde, an alliance dedicated to teaching new players how to PvP. RT Roflin, another member of Essence Distribution and Mining, also wrote Wendy. The awox was the best thing that had ever happened to him, and he knew it. A day after leaving the carebear corp, RT had the courage and motivation to pursue what he really wanted to do in EVE. 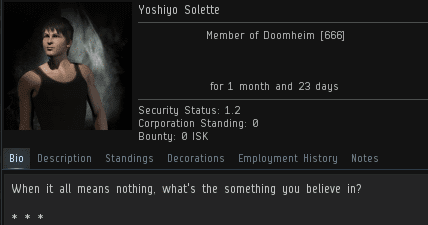 ...And as for Yoshiyo Solette, the CEO who abandoned the corp in response to the awox/wardec? 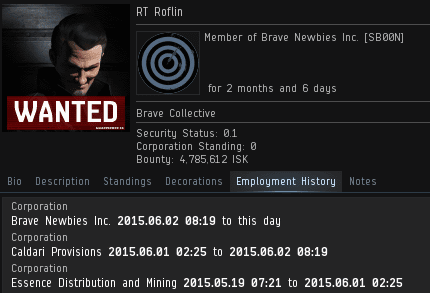 He biomassed his character and apparently quit EVE. Is awoxing highsec PvE corps good for the game? 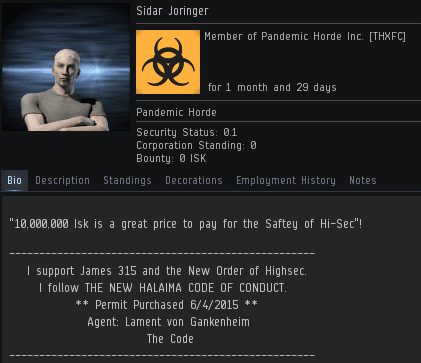 It's stories like this that prove to every highsec resident that the the Code is correct. Highsec carebear corps are there to be destroyed, no, liberated from the bot-aspirant ways of "other" MMOs.. and when they are- the players are freed to pursue actual fun. What more proof does one need that The New Order Method of bringing engaging gameplay to Highsec works? I see ming is still flapping its lips as thou it matters. Oh man what a great story, nice to see the lightbulb go off for people. People seem to think their corp will progress and "level up" like it was a character or something. That corp would never had even made it to low sec, much less null. 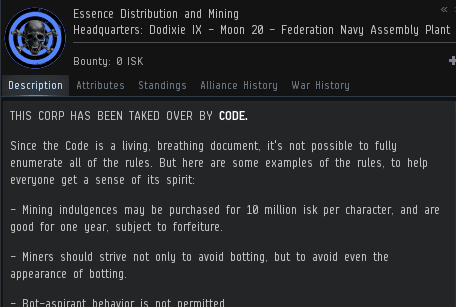 Looks like another victory for the mighty new order and Code Alliance! "Is awoxing highsec PvE corps good for the game?" I'm so glad some of the ex-members moved on to bigger and brighter things. I've said this consistently for the last three years, the worst thing you can do in Eve is join a high sec pve-"training" corp, the second worst is to start one. It's not that they're bad in themselves, it's the people that start them, when there are so many more viable player made solutions existing in low sec and null already with vast resources in the form of SRP and extensive knowledge and legitimate buy back programmes. 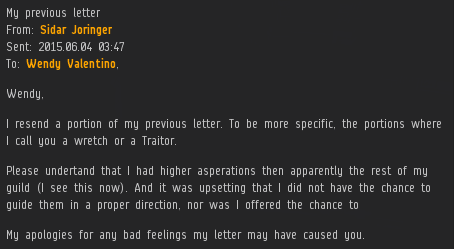 The sweet sound of another player quitting EVE forever. Soon CODE shall be vanquished. If you can't kill the Flood, kill its food. So you'd rather see Eve die than players engage in the content of the game? That really is the diametric opposite to the New Order and every other sensible player of Eve Online. Yeah that worked out great for the Forerunners.... ohwait, no it didn't. But sure, why not, follow the same thought patterns of a race that lead to their extinction, I'm sure it'll work out great for you. I too quit EvE. Too many code monkeys camping my station that I couldn't go make the big isk. Let's play Star Citizen so we can avoid these sociopaths. Karma Fleet, Brave, Pandemic Horde are three of your many many options yet you chose not to play. Eve Online isn't for everyone that much is clear. I hope you find the game that will enrich you and be the better for your participation. 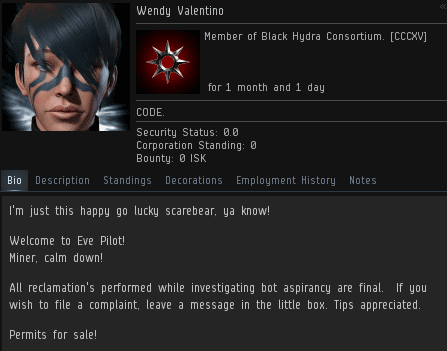 I am not sure CCP would agree it's a good outcome as they lost a subscriber on the way. He would have unsubbed eventually anyway. If losing a corp name is too much for him, then the rest of EVE would have been his utter ruin. Anyone who quits due to our actions will inevitably quit. Those who either laugh at our actions, or swear to seek vengeance, they are more likely to stay. It doesn't matter whether you love us or hate us, as long as you play and enjoy this awful game we all love. To those who moved on to better things, fly fast, fly dangerous, fight hard, and die shooting. To the ONE who quit, good riddance, Eve wasn't for you, you were not strong enough, you were not brave enough, you were not able to adapt or learn. I don't think its a good thing...all the time and I will explain why. If we destroyed all the PVE corps with awoxs...what would the budding higher PvP corps practise their combat on? Destroy the worst offenders (the ones who turtle in station when war comes calling) but ling before I joined a sovbloc Corp, I saw pve corps that actually would try to encourage its members to fight back in wars. These corps, sadly rare nowadays need only a gentle nudge from our agents to be proper PvP corps that can create content. Destroying every pve Corp we find with awoxs might remove the next veers, but it could also remove the next great merc Corp before it even begins. I admit I was surprised so many jumped into Imperium member alliances. On the other hand, over 2/3 of the membership died or went idle. Not sure I'd classify this as a "success" story.